In Banff, we are on Mountain Standard Time (GMT-7 hours). Below are the current conditions in Banff. The views are from the top of the Banff Gondola on Sulphur Mountain. Opposite is a snapshot of a more common winter day in the magnificent Canadian Rockies. 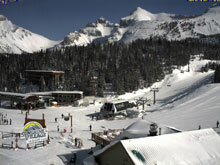 The above Banff live webcams are courtesy of Banff Gondola. If you would like to see these views for yourself, be sure to contact us direct and we can arrange your Banff Gondola tickets.